Some days nothing feels more frustrating than battling allergy symptoms–particularly when you’re at a loss for the source of the issue. For residents of Tucson, allergies can be difficult to manage due to the unique challenges posed by our climate and pollen producing plants. Fortunately, there are simple, everyday changes you can make in order to best prepare yourself for managing your allergy symptoms. With the monsoon rains and mild winters, Tucson is rich in pollen producing plants and therefore a hotspot for allergens. Our gentle winters lack the hard freezes that weaken plants in many regions, allowing for higher pollen count compared to other communities, and keeping residents symptomatic until 100 degree temperatures set in. When it comes to pollen-based allergies, Tucson is home to some of the most potent offenders. High pollen count ragweed as well as rabbitbush, cottonwood, and olive trees may all trigger symptoms. For those sensitive to allergies, Tucson’s beautiful palo verde trees may even cause a reaction. While the monsoon rains provide some relief from the summer heat in Tucson, allergies caused by mold spike after the warm summer rains and might keep you in discomfort long after the pollen count drops. In addition to visiting an allergy specialist, there are a variety of steps you can take to reduce Tucson allergies. Small, easy changes can significantly contribute to your allergy management plan and help you get back to feeling like yourself. First and foremost, take a look at how you’re cooling your home. Swamp coolers draw pollen and other allergens in doors and air conditioning systems need HEPA filters in order to trap allergens before they spread throughout your home. You may also find it helpful to remove your shoes at the door to avoid tracking in unseen allergens. Dust mite allergies can be better managed by regularly washing pillows, bedding, couches, curtains, and other surfaces that might harbor mites. Using down filled pillows and bedding is also inadvisable, as dust mites thrive in the dense feathers and can be challenging to keep in check. It’s also important to make dusting a daily habit to help remove allergens before they can trigger symptoms. Our pets can also bring unwanted allergens into the home, as fur on your dog or cat may trap pollen and other allergens while outdoors. Regular bathing and grooming can help minimize the problem, but it is also recommended to keep pets off furniture and out of the bedrooms of family members with severe allergies. While out and about, be mindful that pollen counts increase in the midday and afternoon. Pollen sensitive individuals may need to try and keep errands to the early morning when pollen counts are lowest to limit allergen exposure. When it comes to managing allergies, knowledge is key. Consult an allergy specialist to identify which pollen producing plants trigger your allergies. Plants such as bermuda grass, mulberry trees, olive trees, and ragweed are commonly found in Tucson yards and may be contributing to your symptoms, so it is wise to check with your allergist when adding new plants to your yard. If you’re suffering from allergies, the first measure you should take to manage your symptoms should be to consult an allergy specialist to outline a treatment strategy. 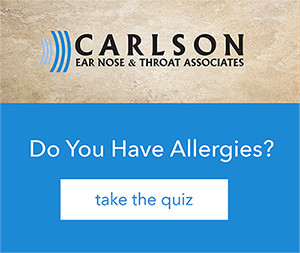 Not sure if what you’re feeling is allergy related? Take our quiz to start the process of finding out!